The tool which we developed for our client’s warehouse management brings outomated management of supplies to distribution warehouses. Although it covers complex processes, it is simple and intuitive to use. It saves time during picking goods for distribution warehouses. It saves money thanks to control of stock level in all locations. Since the begining of our cooperation the number of our client´s distribution warehouses has grown. These warehouses are supplied by goods from central warehouse. Each warehouse covers orders of specific types of goods from specific types of customers. The client has no module for planning supplies for individual distribution warehouses in his internal database systems. That’s why we developed an autonomous tool for supply management. The tool is based on data on SKUs, orders and stock level. The raw data is entered into the service section of the report in the form in which an authorized person obtains them from the internal database system. All other processes in the report are automated and are a matter of few clicks. 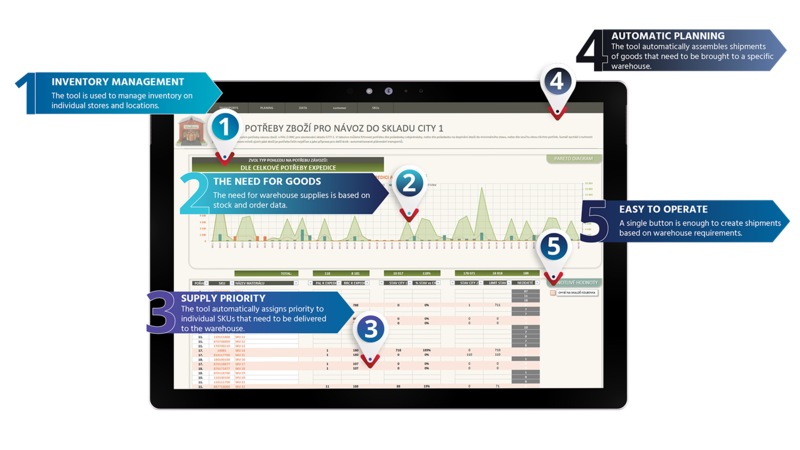 The tool uses complex and efficient algorithms for planning which assign priorities to individual SKUs. The priority comes either from the need to cover an incoming order or from the need to reach minimum stock level. The tool can compose the shipments of supply to individual warehouses completely without human factor intervention. In the shipment planning section, the user composes shipments by simple clicking on one button. 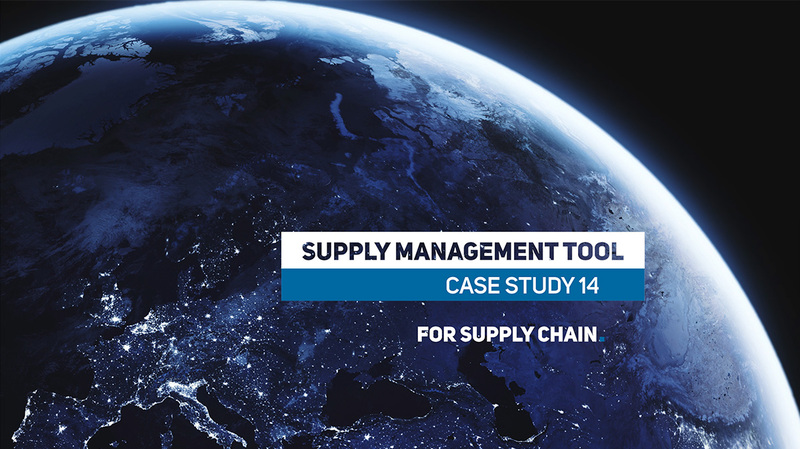 The Supply Management Tool takes into account number of palettes and the weight of the goods so that each transport is maximally loaded but never overloaded. Once the shipment is completed, the goods shipped on it stop appearing among supply requests. We created the tool so that even a user with minimum computer skills can work in it. All shipments can be composed by clicking on a single button and completed shipments are marked by checking a “yes” field. On the other hand, the tool also includes a number of more advanced features. Advanced user can choose which SKUs to include to planning. He or she can also manually manage the supply requests in the service section of the tool. And in shipment planning, which by default prioritizes the supplies automatically, he can modify the number of pallets of individual SKUs, thus changing the composition of particular shipment. Our client currently uses the Distribution Center Supply Management Tool for all his distribution warehouses. And more are to be added. It is a solution that fully replaces a standalone variant in a database system. The solution is transferable to any company that wants to efficiently automate inventory management in its warehouses. We always customise the tool to the needs of the specific client. We have developed a number of solutions related to warehousing. The examples include Warehouse Summary or Daily Productivity Tracking Application.